Friday morning WWE officially announced that former World Champion Alberto Del Rio has been released by the company. Del Rio was serving a 30 day suspension for violating the Wellness Policy. Still no word on what's behind that, but his departure comes as no surprise. He's floundered since losing the U.S. Championship earlier this year to Kalisto. It was about a year ago that Del Rio returned to WWE, beating John Cena for that title. Admittedly, I've never been a huge fan of Del Rio's, but I do respect his work in the ring. After losing Ricardo Rodriguez as his personal ring announcer, I lost interest in the character. It's a shame too, because he has the talent, but I never felt a connection to his character. I was hopeful the League of Nations faction would take off, but the gimmick was over almost as fast as it started. Word on the street now is that Paige has or will be requesting her release from the company. For those who don't know, she and Del Rio have been dating for a while. The loss of Paige will definitely be a bigger than Del Rio. Paige is one of the top females on the roster, and she undoubtedly helped to shape the women's division and laid the groundwork for the "revolution" we see today. But Paige sadly got caught in the cycle of WWE only doing one program at a time for the women, along with being injured. The tide is turning again, but it's likely too late for her to ride the wave. Luckily though Paige is young and talented and even if she is granted her release (again it's an internet rumor right now) she'll be back in the company before she calls it a career. 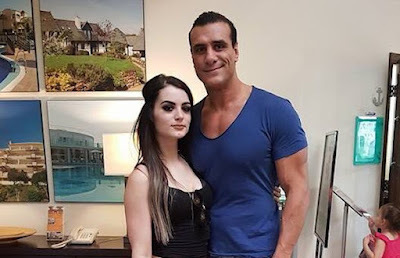 Both Del Rio and Paige will thrive and survive in their post-WWE lives. Del Rio has done it before after all. Best of luck to both of these Superstars.